FIV (Feline Immunodeficiency Virus) should NOT be confused with FeLV (Feline Leukemia) – they are two very different viruses. They are often mentioned together due to the ‘snap’ tests carried out by vets, but they differ greatly in how they affect a cat, and it’s expected lifespan. FeLV is a serious risk to a cat’s health and longevity, whereas FIV is not. Feline Immunodeficiency Virus (FIV) has been associated with cats for many years, although it was only labeled as such as recently as 1986. The virus depletes the number of white blood cells, which eventually makes the cat less able to fight off infection. However, because it is such a slow acting virus many FIV positive cats can enjoy a normal lifespan with no apparent health problems resulting from the virus. FIV is species specific. It can only be transmitted from cat to cat. FIV is not zoonotic; it cannot be transmitted from cats to humans or other animals. FIV belongs to the same group as Human Immunodeficiency Virus (HIV) and for this reason has received much greater attention than it otherwise would. The mere mention of FIV, and the fact that it is sometimes inaccurately known as ‘Feline Aids’, strikes unnecessary terror into the heart of many cat-owners, so it is worth taking time to consider the facts. During initial studies, the viral strains used in laboratories on experimental cats were very virulent, and much previously published information is based on this. However, FIV strains in cats living normal lives tend to be much more benign and may never cause disease. HOW DOES A CAT CATCH FIV? FIV virus is present in the blood and saliva of infected cats. But, like HIV, it is a very ‘fragile’ virus, and cannot survive for long outside the body. It also requires a high dose to establish an infection in another cat. Therefore, it is not easily passed from cat to cat. The main route of infection is through biting, when the virus in the saliva of an infected cat is injected directly into the blood stream of the cat it bites. Conversely, a cat which bites an infected cat, is at less risk of being infected, as the virus would not be injected straight into the blood stream, although there is still an element of risk. Cats who fight are most likely to be infected. Cat fights happen predominantly between unneutered Toms thus unneutered males are most at risk. The majority of cats we see coming out of the shelter who snap positive for FIV are older, unneutered males who have some wear and tear on them and look like they’ve been around the block a few times. Since many feral cats are unneutered and have to compete for food, there is a higher incidence of FIV in feral cats. The take-home message is this: to reduce the risk of fighting males – make sure your cat is neutered! Transmission between cats in a group who do not fight is unlikely as the virus can only survive a very brief time outside a cat’s body, and it cannot be transmitted indirectly, such as on food, feeding equipment, clothes, shoes, hands etc. Recent research suggests the likelihood of cats passing on FIV to others in the same household is as low as 1-2%. It has not been definitively proven that the virus is transmitted sexually, although often a Tom cat will hold onto the scruff of the female’s neck with his teeth, so if the skin is punctured at that point, transmission is possible. But even if sexual transmission is a factor as many suspect it may be, spaying and neutering your cat can eliminate this potential risk factor completely. Signs that a cat has become infected can vary greatly so it is not always apparent until a snap or combo test for FIV and FeLV is done. Often, the cat may develop raised lymph nodes around six to eight weeks after being infected. They may develop a high temperature. Sometimes diarrhea or conjunctivitis (pink eye) may develop, possibly lasting days or even weeks, with the cat then returning to apparent health. Other common signs are gingivitis (gum inflammation), sneezing, snuffling, a discharge from the nose or eyes, or kidney failure. The eyes or brain can be affected in a very small number of cases, resulting in changes in behavior. The fact that the virus depletes certain white blood cells (T lymphocytes), in theory at least, makes the cat more susceptible to other infections, and it will find it more difficult to shake them off. This is known as ‘immunosuppression’ and is identical to the situation in HIV infection. However, this is purely theoretical, and in practice many cats do not have any more infections than cats which are not infected with the virus. The most common infection to occur in FIV positive cats is gingivitis and stomatitis (inflammation of the gums and other parts of the mouth). However, FIV is not the most common cause of gingivitis. Gingivitis frequently develops in cats which are fed on an unnatural diet of poor quality canned food or cheap grocery store dry cat food brands. Cats who are carriers of calicivirus (one of the cat flu viruses) frequently suffer from gingivitis, as well as lot of cats which do not carry either of these viruses. Whatever the cause, gingivitis is treated initially with a thorough dental scale and polish plus a course of antibiotics and a steroid drug to suppress the inflammation. Various other chronic infections may also occur – conjunctivitis, diarrhea, skin and respiratory tract infections (rhinitis or bronchitis). However, these are less common, and again, respond to treatment providing it is carried on for an adequate time. WHAT IS THE LIFE EXPECTANCY OF AN FIV INFECTED CAT? A cat who contracts FIV will still have a strong immune system for several years after infection. It’s only over time that the effects of the virus may start to show and, even then, most infections can be treated with the appropriate medications. With a quality diet, nutritional supplements and attentive care, many FIV+ cats can live normal lifespans. These days, it’s not unusual to find FIV+ cats reaching 15 years or more. Knowing what we now do of the prolonged nature of the condition, euthanasia is totally inappropriate and inhumane. Any veterinarian who suggests it is a veterinarian you should reconsider patronizing as they are clearly not up to date on the most current information about this previously misunderstood disease. A ten-year FIV Monitoring Project was carried out at Glasgow Veterinary School involving 26 cats and the results indicated that a higher percentage of FIV negative cats died during the period of the study than FIV positive cats, and that FIV infection did not affect the cats’ life expectancy. Dr Diane D. Addie, a lecturer in Veterinary Virology, said “at least 3 studies in FIV positive cats have shown a life span equal to uninfected cats.” A fourteen year study by Maureen Hutchison B.Sc, BVMS, MRCVS found that FIV+ cats are more likely to die by being killed in road accidents or to be alive and well into their twilight years than they are to die from any FIV related condition. FIV in the stray cat population has certainly fueled much of the unfounded fear surrounding the virus. It is mainly unneutered Toms, fighting over food, females or territory, who pick up and spread the virus. The stray cat has no one to look after them and their lifestyle increases the risk they are more likely to pick up other infections which, without treatment, can escalate. When one of these cats is captured and taken to a vet, they may be suffering from any number of secondary infections and it is often too late to help them. It is the nature of a vet’s work that they will see many more ill cats than healthy ones, when in fact, there are very many more healthy FIV cats than ill ones – they just don’t need to see the vet. If an FIV positive is more susceptible than an FIV negative cat to being immunity compromised. Displays of any symptoms of illness, however minor, it should warrant a vet visit. Treatment of FIV consists of dealing with whatever symptoms occur in the individual cat. Common infections are generally treated with antibiotics. Once established in a cat’s cells, the virus is permanent, and no proven vaccine* has yet been found. *A vaccine was developed in the US in 2002 but it’s reliability has not been determined. A big disadvantage with the vaccine is that once a cat has been vaccinated, they will automatically test positive on an FIV test even though they don’t have the virus. For these reasons, we don’t recommend the FIV vaccine if a veterinarian suggest one. It neither prevents a cat from contracting FIV or cures a cat if they have been infected with FIV. FIV positive cats should always be spayed or neutered, however if a female FIV positive cat coming out of the shelter happens to test positive for FIV, it is extremely rare for the kittens to become infected with the virus. FIV differs from feline leukemia in that respect. It is not passed on from the queen to kittens in-utero. However, kittens born to an infected mother will absorb antibodies from her milk and will therefore give a positive response to the FIV antibody test. In these kittens the test becomes negative after 12-16 weeks, as their maternal immunity wanes. It is therefore pointless to test kittens individually and independent from their mother’s test when they are under 16 weeks. The most recent research indicates that the chances of FIV being passed from one cat to another in the same household is approximately 1-2%. This means that if you have 100 cats in a house with 1 FIV positive cat, only 1 or 2 could be expected to become infected. Even when FIV was passed on, as one study concluded, none of the cats actually died of it. In another study FIV was not passed from cat to cat in the same household at all. The Celia Hammond Animal Trust has been conducting a long-term study at their sanctuary since the late 1990’s, where FIV-positive and FIV-negative cats live happily together, grooming each other and sharing food bowls and litter trays. Regular blood tests for the virus are carried out and, to date, no cases of transmission have yet been found. Cats are far more at risk of being bitten by an unknown feral or stray FIV positive cat than by a friendly, neutered, FIV positive cat living as part of the family. There seems no reason, therefore, not to have FIV positive and negative cats in the same household, provided they are not fighters. If two cats in one household fight, they should be kept apart. So, this is obviously a decision to be taken on a case by case basis, depending on the natures of the cats involved. A healthy FIV positive cat can live for many years and can often outlive non-infected cats but please be aware that this is not always the case. Due to their impaired immune system, the cat may succumb to illness earlier and not reach their normal life expectancy. FIV cats will need prompt veterinary assistance for even minor symptoms. With good care however, many FIV+ cats can live normal lifespans. One study showed that FIV+ cats are far more likely to lose their lives through being euthanized because no one was willing or able to offer them a home than from any effects of the virus. Kitty Devore Rescue does promote the adoption of healthy FIV positive cats. All KD cats are spayed and neutered before they are considered adoptable by our standards. Since FIV is primarily contracted by deep bite wounds and, possibly, sexual contact, sterilization completely eliminates one of the two possibilities of spreading the virus from one cat to another. In the instance of unneutered Toms, sterilization may be all that is required to eliminate the possibility of biting. Many aggressive Tom cats turn into docile kitties when they have been castrated and no longer have to fight for every mouthful of food. FIV positive cats still find great adoptive homes. Many adopters are far more educated about the disease than in years past and know FIV is not a death sentence. They also know the risk to other cats in the home is minimal. 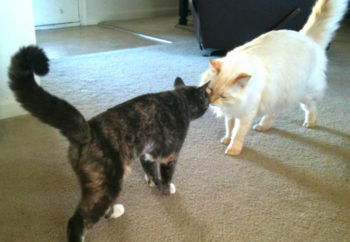 Prisilla (non-FIV kitty) and Charlie (FIV+) – both safe and happily co-existing in the same home. “I’ll tell you what I first thought it was when I found out that our foster kitty, Charley, was FIV+ (feline immunodeficiency virus). It was unknown, scary and in my house! Just like most people who don’t understand this disease, I panicked. Then I put in a phone call to my vet and was referred to some very credible information sites to learn about what had entered my home, besides the beautiful cat that came with it. The very first thing I learned was that there are far more websites with outdated information than there are current information websites. The reason why is simple…it was only discovered in 1986, in a cattery in California. This is a relatively new disease and has had very little research done until around the late 90’s. Even after a quarter of a century this disease is surrounded with myths, untruths and scary scenarios to cat owners and vets alike. Let me break FIV down to the basic facts. It is an immunodeficiency virus; it suppresses the immune system of the host. FIV, by itself, will not cause the death of its host. The diseases and infections that the immune system simply can’t fight off will eventually lead to the cat’s demise. We now know that FIV+ cats and kittens can live a full life with the same life expectancy of a healthy animal as long as they are kept indoors, kept away from sick cats, receive regular vet exams and are fed a high quality diet. What FIV is NOT is a disease that is easily transmitted. FIV can only be transmitted through deep bite wounds that cause bleeding and sexual contact. That’s it folks! Many family cats have been FIV+ for years, right alongside their non-infected feline family, without anyone knowing because there wouldn’t have been any reason for them to have been tested in the first place. Cats cannot get FIV from sharing bowls, litter boxes or beds. Not even grooming will transmit FIV unless there is some kind of blood transfer from the infected cat to the non-infected cat.